If you do not enjoy the feeling of laughing until your face hurts, you must avoid The Servant of Two Masters at all costs. Because if you end up sitting in the Guthrie's beautifully red proscenium theater sometime between now and January 20, you will laugh for two hours straight, and your face will hurt. But if you're willing to risk this pain, if you like silly, outrageous, classic yet modern, slapstick, adeptly executed comedy (with delightful music thrown in), then get yourself to the Guthrie and wade through the throngs of people flocking to that other show and make your way to the theater across the lobby (but certainly don't show up at the Level Five Cafe 40 minutes before showtime expecting to get a table). I don't have the words to adequately describe the experience; it's just beautifully executed comedic Theater. The Servant of Two Masters is an 18th Century play of the style known as "commedia dell'arte," in which masked character types act out familiar comic scenes. 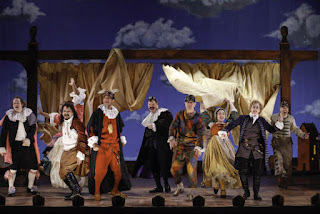 The play arrives at the Guthrie via the Yale Repertory Theatre and several translations and adaptations, the final one by Steven Epp, who also plays the titular dual-mastered servant, and director Christopher Bayes. They've peppered the over 250 year old play with current political and pop culture references, everything from "Gangnam Style" to Titanic to The Music Man to The Mary Tyler Moore Show, and everything in between. They even manage to poke some gentle fun at the Guthrie and the show across the lobby. The comedy is very physical and very exaggerated, a head-spinning mix that'll keep you on your toes. In fact, out of the several dozen shows I've attended sitting in the front row of the Guthrie Proscenium Theater, this is the first time I've feared for my safety a tiny bit. If you're sitting near the front, stay alert. Things go flying and the 4th wall is often breached, sometimes literally. Christopher Bayes was the director of movement for The 39 Steps on Broadway, which is no surprise; this show is a more than a little 39 Steps-esque. In the hands of this incredibly talented cast of mostly Guthrie newcomers (welcome to our beautiful Minnesota winter! ), the original story, the adaptation, the direction, the music, the sets, and the costumes all combine for a ridiculously fun night at the theater. Another first - I've never high-fived an actor after a play, but somehow it seemed acceptable and appropriate after this show. Leading the cast is one of the few locals in the show, Steven Epp, of the late Theatre de la Jeune Lune, and the current innovative theater company The Moving Company. Since I unfortunately never saw a Jeune Lune show, I have only recently become aware of the crazy brilliance that is Steven Epp. By that I mean he is equal parts crazy and brilliant, and you're never quite sure which part will show up. The best is when both parts show up, as they do here. There are similarities between this adaptation and another classic comedy Steven adapted to zany effect, Ten Thousand Things' Il Campiello. In addition to the words, his performance as the servant Truffaldina is playful and unexpected, wacky and entertaining. The well-meaning and always hungry Truffaldina is juggling two masters who, unbeknownst to him, are lovers trying to find their way back to each other. The talented Sarah Agnew (another local cast member) is the lovely Beatrice (pronounced bay-a-TREE-che to dramatic effect), who is in disguise as her deceased brother. Sarah does a beautiful job playing the straight man (literally) amidst the storm of crazy surrounding her. Jesse J. Perez plays her love, Florindo, as something off the cover of a romance novel. As the father trying to marry off his daughter, Allen Gilmore is simply hilarious, and in one prolonged scene had the audience in tears. Liz Wisan is charming as the lady's maid who wins Truffaldina's heart. One of my favorite parts of the play is the music, provided by Aaron Halva on accordion and percussion and Carolyn Boulay on violin. They accompany the cast on a few songs (some of whom have excellent voices, especially Adina Verson as the daughter) and provide a soundtrack for the action, and really feel like part of the play rather than "just" the band. The sets (Katherine Akiko Day) and costumes (Valerie Therese Bart) are also delightful. There is no backdrop on the stage, there is no backstage, the entire area is in full view. A curtained area in front frames the main action, and charming tiny houses hint at the town. Costumes, make-up, and masks are as exaggerated as the comedy. 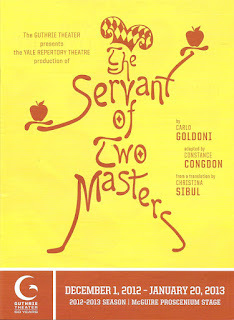 The Servant of Two Masters is playing now through January 20, so you have plenty of time to go see it, even in this busy time of year. It's relentless ridiculous over-the-top comedy, even the actors couldn't keep a straight face. It never lets up; you'll be crying "Chanhassen!" by the end. And if you want to know what I mean by that, go see the show!